Provost, F.; Malet, J.; Hibert, C.; Abanco, C.; Hurlimann, M.
The objective of this work is to propose a standard classification of seismic signals generated by gravitational processes and detected at close distances (<1¿km). We review the studies where seismic instruments have been installed on unstable slopes and discuss the choice of the seismic instruments and the network geometries. Seismic observations acquired at 13 unstable slopes are analyzed in order to construct the proposed typology. The selected slopes are affected by various landslide types (slide, fall, topple and flow) triggered in various material (from unconsolidated soils to consolidated rocks). We investigate high-frequency bands (>1¿Hz) where most of the seismic energy is recorded at the 1¿km sensor to source distances. Several signal properties (duration, spectral content and spectrogram shape) are used to describe the sources. We observe that similar gravitational processes generate similar signals at different slopes. Three main classes can be differentiated mainly from the length of the signals, the number of peaks and the duration of the autocorrelation. The classes are the “slopequake” class, which corresponds to sources potentially occurring within the landslide body; the “rockfall” class, which corresponds to signals generated by rock block impacts; and the “granular flow” class, which corresponds to signals generated by wet or dry debris/rock flows. Subclasses are further proposed to differentiate specific signal properties (frequency content, resonance, precursory signal). The signal properties of each class and subclass are described and several signals of the same class recorded at different slopes are presented. Their potential origins are discussed. The typology aims to serve as a standard for further comparisons of the endogenous microseismicity recorded on landslides. The objective of this work is to propose a standard classification of seismic signals generated by gravitational processes and detected at close distances (<1 km). We review the studies where seismic instruments have been installed on unstable slopes and discuss the choice of the seismic instruments and the network geometries. Seismic observations acquired at 13 unstable slopes are analyzed in order to construct the proposed typology. The selected slopes are affected by various landslide types (slide, fall, topple and flow) triggered in various material (from unconsolidated soils to consolidated rocks). We investigate high-frequency bands (>1 Hz) where most of the seismic energy is recorded at the 1 km sensor to source distances. Several signal properties (duration, spectral content and spectrogram shape) are used to describe the sources. We observe that similar gravitational processes generate similar signals at different slopes. Three main classes can be differentiated mainly from the length of the signals, the number of peaks and the duration of the autocorrelation. The classes are the “slopequake” class, which corresponds to sources potentially occurring within the landslide body; the “rockfall” class, which corresponds to signals generated by rock block impacts; and the “granular flow” class, which corresponds to signals generated by wet or dry debris/rock flows. Subclasses are further proposed to differentiate specific signal properties (frequency content, resonance, precursory signal). The signal properties of each class and subclass are described and several signals of the same class recorded at different slopes are presented. Their potential origins are discussed. The typology aims to serve as a standard for further comparisons of the endogenous microseismicity recorded on landslides. 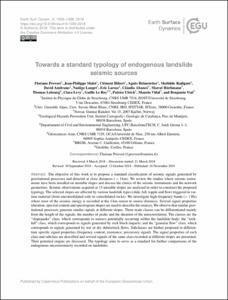 Provost, F., Malet, J., Hibert, C., Abanco, C., Hurlimann, M. Towards a standard typology of endogenous landslide seismic sources. "Earth surface dynamics", Octubre 2018, vol. 6, núm. 4, p. 1059-1088.